"Sampath Speaking" - the thoughts of an Insurer from Thiruvallikkeni: Panthera leos captured in Gujarat to identify real man-eater !!! Panthera leos captured in Gujarat to identify real man-eater !!! 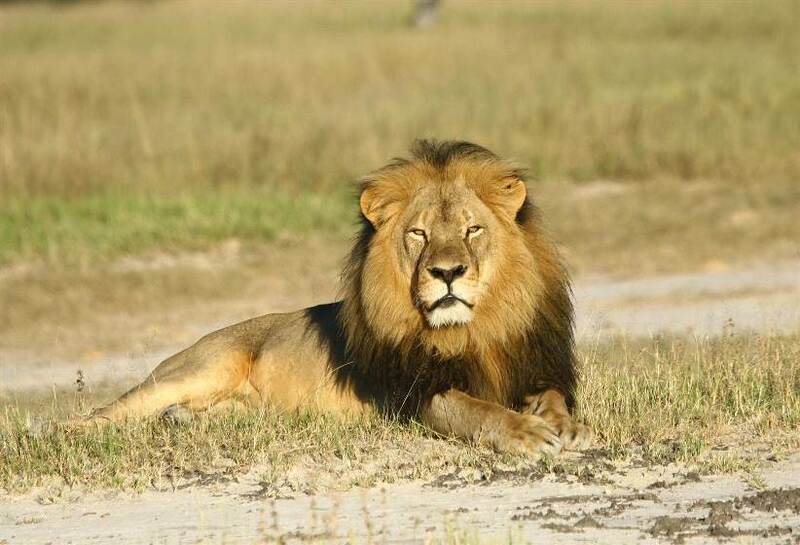 They easily are majestic and the most attractive in animal kingdom… on 2nd July last year, Cecil the Lion – a 13-year-old, black-maned, pride-leader – was killed by trophy hunter Walter Palmer in Zimbabwe. The surprising thing about Cecil is not how he died – around 600 lions die every year at the hands of trophy hunters – but at the reaction to this particular killing. As details of Cecil’s grisly – and possibly illegal – death leaked out, the news blew up on social media and in the press, surprising conservationists who saw this kind of thing with depressing regularity. The lion (Panthera leo) is one of the big cats in the genus Panthera and a member of the family Felidae. Wild lions currently exist in sub-Saharan Africa and in India. In the wild, males seldom live longer than 10 to 14 years, as injuries sustained from continual fighting with rival males greatly reduce their longevity. In captivity they can live more than 20 years. A pride of lions consists of related females and offspring and a small number of adult males. While lions do not typically hunt humans, some have. Cecil, photograph at the beginning, was not the only one to be affected by lion. Latest reports suggest that one of a group of five well-known desert-adapted lions in northwestern Namibia has been shot dead, likely by a disgruntled farmer, conservation groups say. Harry died of a bullet to the chest on Sunday morning, the Desert Lion Conservation group said on its website. Harry was one of the "Five Musketeers", a group of brothers who together roam the harsh remote areas of northwestern Namibia. ~ - ~ and back home in India, Forestry officials last week have caught and caged 13 Asiatic lions in western India after at least three people were killed by them. Quoting Gujarat's chief conservator of forests, it is stated that the lions were captured from an eastern part of the sanctuary, their last remaining natural habitat. "Lions that have preyed upon humans will be analysed in detail, while the rest will be slowly introduced back into the wild," an official told the AFP news agency. He added they would find the lions responsible for the killings by analysing their faeces for human tissue. Last week, a 14-year-old boy was dragged away by lions as he was sleeping in a mango orchard outside his home. His father was injured when he tried to stop the attack. In April, the lions killed a 50-year-old woman as she was asleep in a field, and a month earlier a 60-year-old was killed in his hut in the same village as the boy. The Asiatic lion was listed as endangered in 2008, an improvement on a critically endangered listing in 2000, after numbers increased in the forest. Of them at least 18 stand arrested in Gujarat. Forest officials in Gujarat state will test the lions' prints and excrement in an attempt to identify the killer. 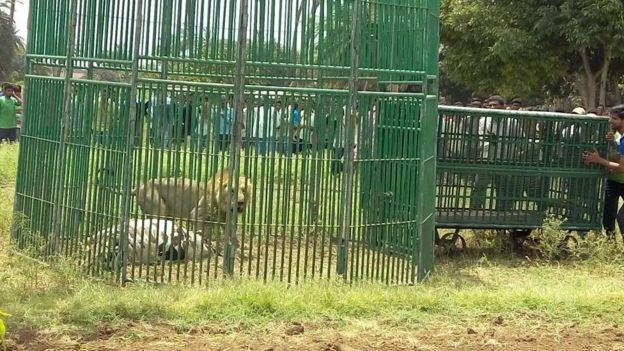 The "guilty lion" will be kept in a zoo for life while the others will be released back into the Gir sanctuary, the officials told BBC Hindi. Wildlife expert Ruchi Dave told the BBC that the "tests" involved studying the pug marks and faecal matter of the lions. "The officials are also studying the animals' behaviour. Man eating lions usually get aggressive at the sight of a human being," she said. Another wildlife expert Revtubha Raizada said the man-eating lion would be caged for the rest of its life, as it was too unsafe to release it back into the wild. Some experts feel that the thriving lion population in Gir forest is to blame for the "unusual" behaviour by the lions. Govind Patel, the former chief wildlife warden of Gujarat, told the Indian Express newspaper that Gir could accommodate only 270 lions, forcing some prides to settle outside the boundaries of the sanctuary. India's Supreme Court has ruled that Gujarat needed to relocate some of its lions to other states to avoid the possibility of disease or other disaster wiping out the entire population. However the state has expressed reluctance and has not yet complied with the order.